Heather Almager is a hairstylist and make-up artist for Beauty & The Beach. Her family includes her husband Abe, and stepson, Chase. She first found a lump in her breast 4 years ago, when she was 30 years old. She went through a lumpectomy only to have the lumps return and cover the same breast a year later. Shen then had to have a mastectomy, with lymph nodes also removed from her armpit on that side. After a setback with an infection from the expander, Heather had her last reconstruction a year ago, and by God’s grace, she is clear of any cancer now! 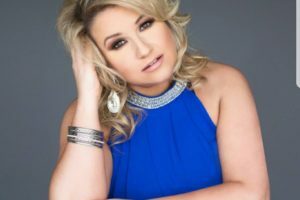 She feels that people should donate to her because she has made it her mission and platform to educate women in knowing “Breast cancer awareness with early detection” while competing in pageants. Most recently, during Mrs. Indiana America in which she competed and met 15 amazing women, she was able to share her story of “Strength.” As a survivor, Heather is passionate about education for early detection. Regular mammograms are not suggested until age 40, yet knowledge and confidence in self-exams needs to be available for all ages. If not for early detection, given her age, there was a good chance that she wouldn’t have such a happy survivor story to share today. Random fact: She once did hair for an artist in a famous rap group and was asked to go on tour with them as their hairstylist for the summer. Other fun facts: Heather comes from a very large family of five brothers and one sister (she is the middle) and has 13 nieces and nephews.